Banks are out of cash. ATMs are broken. Frustration has given way to anger. Five days ago India suddenly banned more than 80% of its rupee notes, launching a currency exchange program that has been dogged by logistics snafus, poor banking infrastructure and intense demand for the new money. Prime Minister Narendra Modi said last week the ban on old 500 and 1,000 rupee notes would strike a blow against corruption and tax evasion. The shock move has been hailed by supporters as a "masterstroke." Citizens rushed to swap the banned notes -- India's largest -- for new bills issued by the Reserve Bank of India. But demand has overwhelmed the country's banks, which stayed open over the weekend in an attempt to process more transactions. On Monday, lines to exchange money were again thousands deep and anger was mounting. There have been reports of scuffles, and some outraged customers have smashed ATM screens. 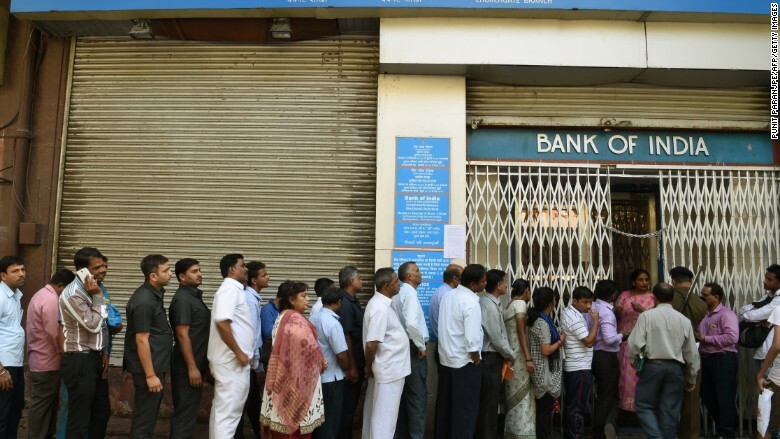 "There will be a lot of trouble ahead if things don't go back to normal soon," said Sanjay Padole, who said he had been waiting to withdraw money for more than three hours when he spoke to CNNMoney. People across India lined up at banks to exchange 500 and 1000 rupee notes. The pain has been particularly intense because cash is used for 98% of consumer transactions, according to PricewaterhouseCoopers. The country of 1.3 billion has just 200,000 ATMs -- and roughly half of those are broken. "If 10 people withdraw money then the cash gets over," said Sunil Chadha, 54, who was waiting in line at an ATM in New Delhi. "The government's decision is good, but they haven't backed it up with a plan of action." 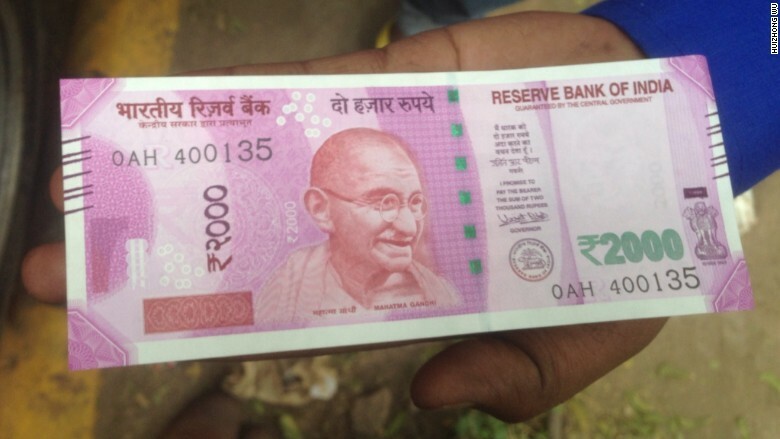 The new 500 and 2,000 rupee notes are narrower and shorter than the old bills, meaning ATMs must be "recalibrated" — a procedure that will take at least two weeks to be implemented nationwide. Officials said the first of the recalibrated ATMs will stock the new notes within the next couple of days. Until then, the largest bill Indians can get from an ATM is the 100 rupee note, worth just $1.50. There's another problem: In a country where everyday transactions typically involve just a few hundred rupees, many people are finding the new 2,000 rupee note to be of little use. "No one takes them, and [those shops] that do want us to spend the entire 2,000 rupees," said Manoranjan Thatoi, who manages construction workers. "That's also a huge problem, because we never spend more than 500." The cash squeeze is huge. Government figures show that around 3 trillion rupees ($44 billion) in 500 and 1,000 rupee notes were deposited into the banking system over the past four days. About 500 billion rupees ($7 billion) have been withdrawn. The government has urged citizens to put up with the "temporary inconvenience" in return for long term benefits to the Indian economy. It has also tweaked the exchange program. 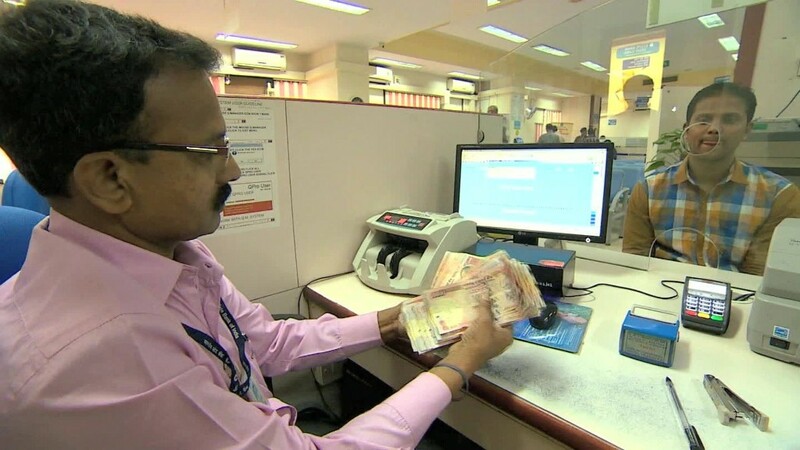 The number of rupees Indians can exchange each day has increased to 4,500 rupees from 4,000. The amount they can withdraw from ATMs has also been increased to 2,500 rupees per day from 2,000. Government hospitals, railways and utility providers have been told to honor the old notes until Nov. 24. A new 2,000 rupee note has been issued by India's central bank as the government battles corruption. The exchange program has also left Indians abroad in the lurch. By Monday, expatriates in cities such as Hong Kong and Abu Dhabi had all but given up trying to trade in their canceled notes. "We stopped buying or selling these 500 or 1,000 notes right from the night the announcement came through," said Sudhir Kumar Shetty, president of Abu Dhabi-based currency trading firm UAE Exchange. Expats hoping to swap notes could be forced to return to India, or send an authorized representative with the cash. "Because of some rich people, everyone suffers," said Sushil Jadhwani of 7 Star Money Exchange, which is based in Hong Kong. The prime minister, however, sees it differently. "The poor are sleeping peacefully," Modi said in a speech on Monday, "while the rich are running around trying to buy sleeping pills." -- Omar Khan, Zahraa Alkhalisi and Josh Berlinger contributed reporting.